Pie crusts are for pies, right? Not always! 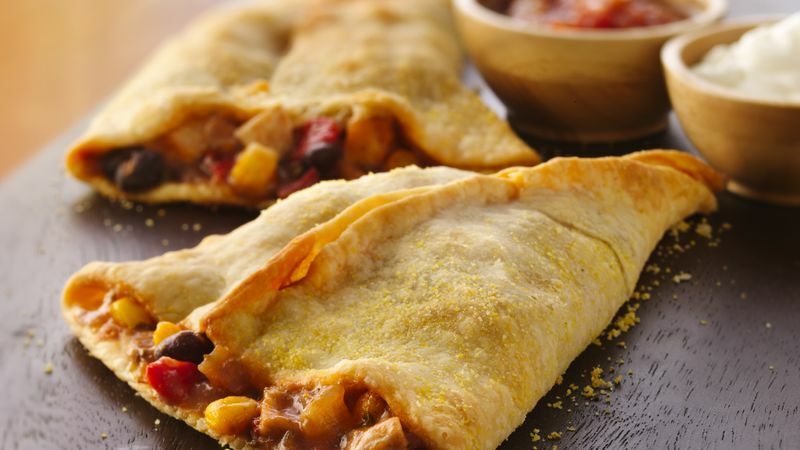 Pillsbury shows us how to make a savory chicken dish perfect for any tailgate with … pie crusts! Tired of the same old tailgating fare, but you need a little inspiration? We’ve got plenty of that and a new one from our friends at Pillsbury. Say hello to the Chicken Empanada Cone, which is a deliciously savory way to do pie crusts! In 1-cup microwavable measuring cup, microwave water on High 1 minute. Add raisins; set aside. In small microwavable bowl, microwave 1 tablespoon of the butter on High 10 to 20 seconds or until melted. Stir in agave sweetener; set aside. Chop enough cilantro to measure 1 tablespoon; set aside. In 10-inch skillet over medium heat, melt remaining 2 tablespoons butter. Add onions; cook 2 to 3 minutes, stirring frequently or until onions are softened. Sprinkle with flour; cook and stir 3 minutes. Stir in reserved liquid from can of frijoles negros. Reduce heat to medium-low; cook until thickened, about 4 minutes. Stir in the frijoles negros, chicken, corn, roasted peppers, 1 tablespoon chopped cilantro, garlic salt, cumin and pepper sauce. Bring to a boil; reduce heat to medium-low. Simmer 10 to 15 minutes, stirring frequently or until most of the liquid is absorbed. Drain raisins; chop raisins and stir into chicken mixture. Cool slightly. Heat oven to 450°. Line 2 large cookie sheets with cooking parchment paper or spray with Crisco® Original No-Stick Cooking Spray. Sprinkle cookie sheets with cornmeal. Unroll pie crusts. Roll each into 13-inch round; cut each round into quarters. To make each empanada, place piece of pie crust on cookie sheet, pressing into cornmeal. Brush center with agave mixture. Spoon rounded 1/3 cup of the chicken mixture in center. Bring long sides of dough together, forming a cone shape. Press to seal, leaving rounded end open. Repeat with remaining pie crust, agave mixture and chicken mixture. Bake 13 to 18 minutes or until golden brown. Serve empanadas with salsa, sour cream and remaining cilantro.